An SR101 reader shared this Clorox Bleach stain remover for whites review. This is a laundry pretreater product that is designed to be used only on white fabrics, because it contains chlorine bleach. Do not be misled by the Clorox Bleach Stain Remover pretreater spray for white clothing. Most white clothing cannot tolerate products that contain chlorine bleach. If you use this product to remove a stain on a white garment that permits the use of non chlorine bleach (but not chlorine bleach) it is likely to leave a yellow stain. At least this was my experience when I attempted to remove a tomato sauce stain from a white shirt. This pretreater is only to be used on white garments that can be bleached, and from my experience there are few being produced. I believe the packaging of this product can easily mislead the consumer. Thanks so much for this review, although I'm sorry you had a bad experience with the product. I did some research about this product, since I hadn't actually realized it was available. There are actually two types of products from Clorox for laundry pretreating, those which are for use only with whites (what you used) and those which are color-safe, labeled as Clorox 2 products. I did note that this pretreater should only stay on the garment for 5-10 minutes before washing, which makes sense since it contains chlorine bleach. The website does state that it is "Not recommended for use on silk, wool, mohair, spandex and non-fast colors." However, it does say "Most white garments can be pre-treated" with this product. Therefore, I would love to hear from even more people who've used it on white clothing, sharing if it works well for you, or if you are also getting a yellow stain from using it on these fabrics. You can share your reviews and experiences here, or read other laundry pretreater reviews that have already been submitted. 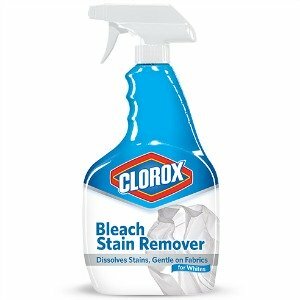 This is the best bleach stain remover I have ever uses. Put it in a gray sweatshirt that had an old stain on it and it came out without changing color of sweatshirt. Use it all the time and now I can’t get it???? Please let us all know. This website is owned by me, a regular human being who is not affiliated with Clorox in any way. I wish I could be of assistance, but you would need to ask the company itself why they've discontinued the product or otherwise you can't find it in stores. Demanding a response from me will unfortunately not provide you with any answers. I suggest asking the company directly. Please respond let us know why we cant find this product "Clorox Stain Remover for Whites"
It worked unlike everything else I've tried and then... My wonderful husband thought it was a great Idea to clean two bathrooms with it and used every bit of my Clorox stain removal for whites. It would not have been my 1st choice to clean my sinks showers and toilets but it did clean my bathrooms!! Then I realized of course I the store had quit selling it! Don't do this to us please bring it back! Nothing else to date even measures up and my husband and I will be walking around forever with stains on all of our whites because nothing else ever works. Works great but cannot find it anywhere again. How can I get more? Thanks. I had stains on an expensive white bed sheet that I had tried everything to remove, and could not. A friend loaned me a bottle of this and it worked the first time. I was totally amazed. No longer on the shelves?? Thus product is the best for whites! I can’t find it anymore ...why??? It works well on all the clothing items I used it on. No yellow, and stain gone. What more can I ask? But now I cant find it. Why? I too love this product! So sad that it is no longer available. Wish it would return to store shelves. My daughter and I live in the Chicago, IL area and are very frustrated at not being able to locate this product anywhere in stores around us. Does anyone know if this is a temporary Clorox problem? I chose the Clorox 2 version for Colors as an attempt to remove 32 yr. old baby formula stains on several items hand made by my husband's grandmother for our daughter... who is now expecting her own baby! How nice to be able to pass these treasures down to the next generation! I felt the Clorox 2 was a safer choice than the bleach version even though the items were white. Unfortunately, I failed to note the single sentence in small print on the back of the container stating that the Clorox 2 shouldn't be allowed to dry on the item. All items now have patches of yellow on them and are ruined. The company rep told me the fibers are now actually dyed yellow permanently, and the only fix that MAY work would be to dye the clothes white. Very tough lesson to learn, the hard way. READ THE BOTTLE! I have used this product and removed so many, many stains from a variety of white fabrics, cotton, polyester, etc. Too date, no yellowing. If something does yellow I will not use it on that fabric again and will appreciate all the garments I have rescued. I have used the oxygen bleach variety for colors and had great results. Why can't I find this anymore? I bought it at Target and they no longer carry it. This is the best of the best stain remover for whites! I used it on clothing that I thought I had to throw away because of stains ordinary washing with bleach wouldn't remove stains. When I pre-treated with this stain remover for whites omg I had new shirts and white pants again! I paid $3.29 at Target for a 30 oz bottle now I can't find it in any store in LA or the OC! Amazon wants $15 a bottle bc someone knows how great this product is and resellers got greedy! I'm so upset that this product can't be found except for by the price gougers! I'd like to know why Clorox allows this to go on! Why is it no longer on shelves? Because some idiot can't read a label? I love this product, but I can't find it any more. It worked really well on dish cloths and towels, getting out all kinds of stains. I didn't use it on any clothing though. This is the best product for white cotton shirts for the collar and sleeve edges. When applied it turns any stain to bright yellow color which means it has just chemically reacted to the stain. Wait 5-10 minutes and wash with Sun detergent with oxiclean. I wash if warm water, with the longest cycle. Then you are done. No scrubbing. The only issue, I have is that Walmart took it off the shelf and I had a bad spray bottle. I will plan to call Clorox to see if the defect in the spray can be resolved. I used the Clorox Stain Remover for Whites and I think it is great. My grandson gave me one and I used it for my husbands greasy socks and other things. I works. I have used it all and now I cannot find it anywhere. Use it as directed and it will work wonders for you.